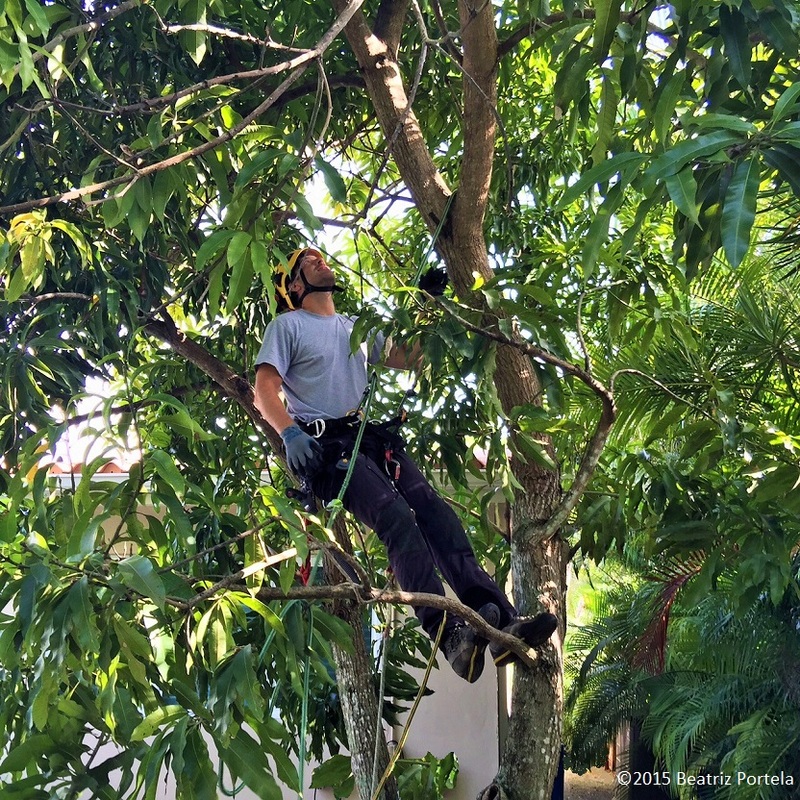 Master Arborist Sebastian Koerber began taming my mango trees today. He cut off some of the larger branches primarily from the center and bought down the canopy a little. Then with gardener Andy, they trimmed some of the smaller limbs. This is the first pruning of a 3-year plan. Next year the canopy will be cut down lower and by the third year’s trimming the trees should be pruned down to the desired manageable size, just below the electrical wires. Hopefully the mango crop will not be affected too much. This is why the beasts are being subdued s-l-o-w-l-y. I’m enjoying following your mango pruning progress, while tidying up my balcony garden with scissors! You’ve reminded me that I must plan my visits to my ‘other garden’ this autumn to catch the right weeks for apple picking. Thanks for the regular glimpses of a very different garden. Ha, Ha I love that: “tidying up my balcony garden with scissors!” I have to do the same for my potted plants! Oh, a big operation was going on in your garden! Hope you don’t mind that I have nominated your blog for ‘Sisterhood of the World Blogger Award’. It would be great if you have time to answer to the questions I made. Thanks. Yes, thanks for the nomination. I promise I’ll do a reply post this week, though I may have to plead the 5th on one of the questions! Every mango has a story.